From Strictly Come Dancing to pub quizzes, the sky is the limit when it comes to ways that you can make a difference to people experiencing homelessness. Dublin Simon Community have a dedicated events team to support you every step of the way with your fundraising event – from getting your idea off the ground to maximising the income on the day. Regardless of what event you’re planning to organise, there are always key things to bear in mind – like where it will take place? How to advertise it? What to do if it rains? This is where our dedicated events team can lend a hand …we are here to answer any questions you have. There’s no question too big or small! The more involved the merrier. Ask your family, friends or colleagues to support you. And remember, whatever event you choose to organise, the Dublin Simon Community fundraising team is here to support you all the way. It couldn’t be easier, just e-mail your name, and number to Mariya at MariyaShevchenko@dubsimon.ie and we will be in touch. Or call us on 01 472 2133. We would be thrilled to hear from you! 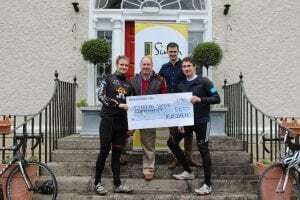 Sam McGuinness, CEO, and John Sansome of the Dublin Simon Community are presented with a cheque from the 2017 Head to Head cycling challenge.